Paddy and Natalie light up the pages with their second chance at romance. 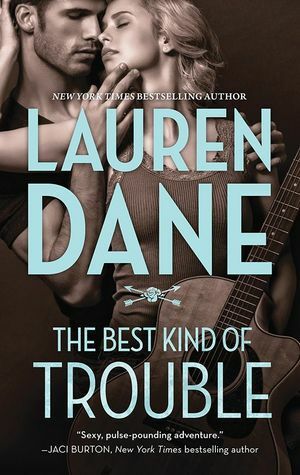 A rockstar and a librarian seem an unlikely pair, but Ms. Dane shows readers how opposites attract. It’s clear from the onset that the Hurley brothers are not easily deterred. Paddy knows what he wants. Namely a smart, funny beautiful blonde from his past, and he impressed me with his tenacity when blending past and present proves to be trouble. This couple has a rhythm all their own. At times it's hot, hard and fast, and other times steamy, sweet and slow. Regardless of the pace, it’s a song you want to hear over and over. The Best Kind of Trouble is a diamond. A strong beginning to what looks to be a fantastic series filled with lust, love, a lot of Hurley men and the strong women that will capture their hearts. I loved the slow build and the conflict in The Best Kind of Trouble, but it was the dynamic of a supportive family, one that calls you out on your crap while helping you up, that sealed the deal on this being a 5 star read for me. Tuesday and Ezra have scars. Deep scars. I’ve been intrigued with them throughout the series and they didn’t disappoint. Their steady build to explosive was hot, hot, hot. These two have non-stop chemistry. Both of these characters are strong, good people with very real fears. Loving someone doesn’t come with guarantees. They couldn’t be more perfect for each other. I found myself routing for them and loving every minute of seeing them fall hopelessly in love. Ezra was at times a surprise, a very pleasant surprise. His growth was beautiful to witness as he steadily reemerged himself in areas he had been holding back on. I was awed by the way Tuesday loved Ezra. How she showed him that he deserved her love, and that she does in fact love all of him ~scars and all~ that he has nothing to prove to her. I felt the walls cracking through out the book, but that moment when they truly break open was magical. A must read 5 star. Kelly and Vaughan melted my heart in Back to You. There is something really special reading about characters that know they’ve had “the one”, that they had everything they ever wanted and let it go. That very much describes Kelly and Vaughan. Their story really made me feel. There were times that I was laughing out loud and other times I was close to tears. I loved that Kelly stood up for herself and her family. That despite Vaughan’s many missteps and faults, she saw the good in him, saw past the hurt and gave him a chance. I also loved that she made him earn it. Sharon Hurley is a force and I love her. I found the woven threads of motherhood, both the good and the bad, made this story soar. As always, the Hurley’s were entertaining and easy on the eyes. In the end, it was Vaughan’s mighty powers that kept me captivated. The honesty in his character was refreshing. Vaughan and Kelly finding their timing was a 5 star read for me. Ms. Dane ended the series with nothing less than raw honesty and flawless execution. I will binge on this series for years to come. My only regret is that it’s over.